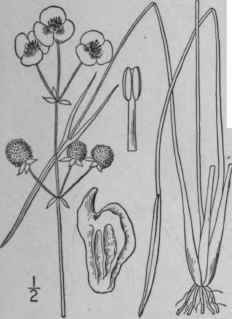 Sagittaria sagittaefolia var. longirostra Micheli in DC. Monog. Phan. 3: 69. 1881. 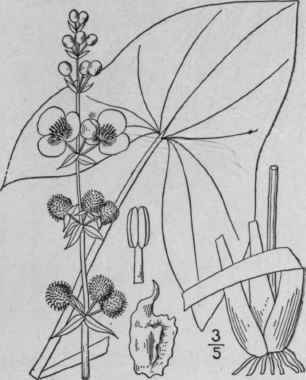 Sagittaria longirostra J. G. Smith, Mem. Torr. Club, 5: 26. 1894. Monoecious, glabrous, scapes erect, rather stout, 1 1/2°-3° tall. Leaves hastate or sagittate, 4'-12' long, abruptly acute at the apex, the basal lobes ovate or ovate-lanceolate or linear, acute, one-third to one-half the length of the blade; scape usually longer than the leaves, 6-angled below; bracts triangular-lanceolate, acuminate, 7"-15" long, longer than the fertile pedicels; petals 8"-14" long; filaments glabrous; styles curved, twice as long as the ovaries; achene obovate, about 2" long, winged on both margins, the ventral margin entire or undulate, the dorsal eroded, its sides with a short crest, its beak stout, erect or recurved. 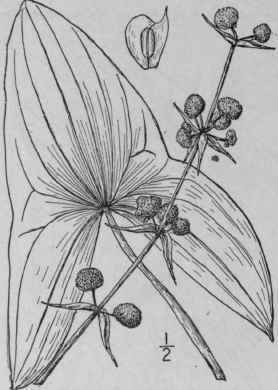 Monoecious, glabrous, scape erect or ascending, slender, 8'-2o' high. Leaves narrow, 1 1/2'-8' long, 1"-4" wide, acute or obtuse at the apex, the basal lobes narrowly linear, acuminate, one-third to one-half the length of the blade; scape striate, about as long as the leaves; bracts lanceolate, acute, shorter than the slender fertile pedicels, 4"-6" long; flowers 7"-12" broad; filaments glabrous; style about twice as long as the ovary; achene cuneate, 2" long, winged on both margins and with 1-3 lateral wing-like crests on each face, the beak stout, erect, about \" long. In shallow water, Massachusetts, Connecticut and Rhode Island. Arrow-leaf. Aug.-Sept.
Sagittaria cuneata Sheldon, Bull. Torrey Club 20: 283. 1893. 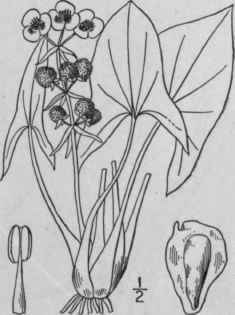 Sagittaria arifolia Nutt. ; J. G. Smith, Rep. Mo. Bot. Gard. 6: 32. 1894. Sagittaria arifolia stricta J. G. Smith, Rep. Mo. Bot. Gard. Glabrous or nearly so, terrestrial or submerged, scape weak, ascending or floating, 2/3°-2° long. Leaves sagittate, linear-lanceolate to ovate, 1 1/4'-6 3/4 long, acute or acuminate, long-petioled; phyllodia, when present, of two kinds, the one petiole-like and about as long as the leaves, the other lanceolate and clustered at the base of the plant; bracts lanceolate or linear-lanceolate, or rarely ovate-lanceolate; flowers 6"-12" broad; achene cuneate-obovate. i"-i 1/4" long, the beak minute, erect over the ventral wing. In mud or water. Nova Scotia and Maine to Quebec, British Columbia, Connecticut, Kansas, New Mexico and California. July-Sept. In the first edition both figures 196 and 197 and the descriptions apply to this species.